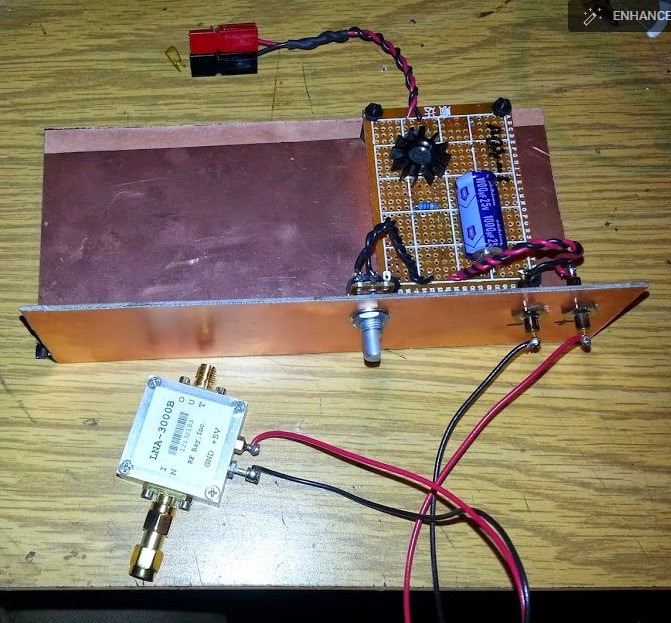 I'm planning to include a 41db voltage-variable-attenutator in my HF Upconverter. So I needed to build a tiny voltage-variable supply capable of 17vdc max down to 1.2vdc. I discovered that using an LM117 was a nice way to accomplish this. Since I needed something more than a voltage divider and it needed to have a fairly large range. 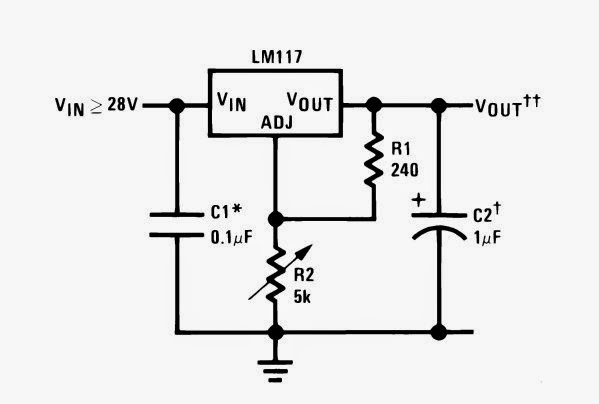 1.2vdc-17vdc. Input to this supply will be around 18-20vdc (I need to test what I need before I'm sure exactly) I think there's about a 1.2vdc drop with the LM117 (something like that) so in my test feeding it with 13.8vdc output around 12.4vdc (from memory I didn't actually log it), but when turning the poteniometer all the way it went all the way down to 1.2vdc. I simply followed the Datasheet for part values as a default. Seems to work well. Minus a few minutes to read the Datasheet, and solder the parts up this took about 30 minutes to build. And seems to work JUST LIKE I HOPED. Below is the start of a 13.8vdc INPUT and 1.2-38vdc @1.5amp Variable Power supply I've started building. It's super simple to build this. Takes just a few minutes with the right parts. 2 caps, 1 fixed resistor, and a 5k variable pot plus the LM117 and a tiny DC-DC BOOST converter capable of up to 40vdc output. Input to the DC-DC boost in my case is a 13.8vdc supply that is common to a lot of things I already use in the shack. Although it could be just about anything < 40vdc (approximately). 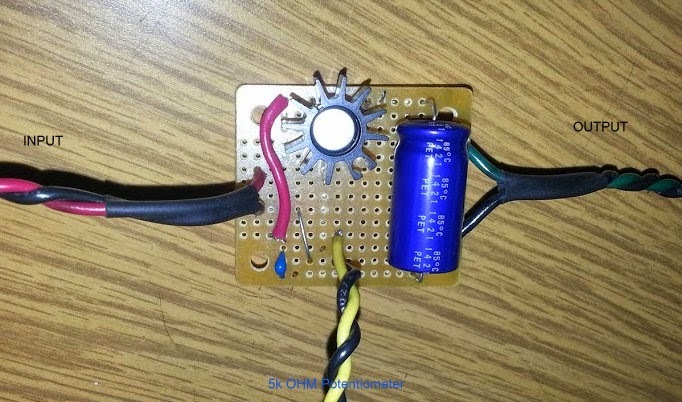 The LM117 max output is only about 1.5amp but this is more than enough for testing simple stuff in most cases (that I would be using something like this for). Usually I'm trying to test a LNA and the mass of LNA's I have range from 5vdc to 28vdc all of them draw very few mA's. So this is more than enough to use as a simple test bench variable supply for this. This is a picture of the beginnings of my stand-alone supply. I have a LOT of options I could incorporate with something like this, and probably will eventually. I haven't added the DC-DC Boost supply to this yet, I had to order a second one since I already used the first one I bought. These supplies only cost < $8USD on ebay. The few other parts listed about are also < $8.00 for the most part. Space to the LEFT will contain the DC-DC Boost converter. the LM117 is to the right with the small heatsink attached. In this configuration I just connected it directly to the 13.8vdc regulated supply I meantioned earlier. After I add the DC-DC Boost Converter it will connect to the converter, and the converter will then connect to the 13.8 vdc supply. I could add a rotary switch with preset resistance with a bypass switch to the variable pot for convenience. Then I could perhaps have presets of 2.5vdc, 3.3vdc, 5vdc, 6vdc, 9vdc, 10vdc, 12vdc, 15vdc, 20vdc, 24vdc, and 28vdc for convenience. Just a matter of adding the switches, and some resistors. I'll post more pix as this little project moves forward.